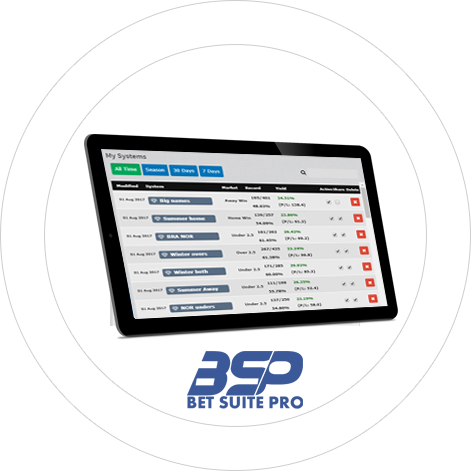 With our easy-to-use system creator, you can build a football betting system within minutes. BetSuitePro will do the hard work, back-test your system and find the current games that fit. Our software covers 37 football leagues, including thirteen summer leagues. This means there will be hundreds of matches to analyse for potential betting opportunities every week. Our extensive football betting database offers you more than 40 different filters, including Leagues, Time Period, Teams, Odds Range, League Position, Goal Statistics and Streaks. Browse Shared Systems to find and copy profitable systems. This is the quickest and easiest way to gain insight from data-based research made by other members of BetSuitePro community. Create easily your own systems portfolio that fits your betting style. Choose the markets, leagues or teams you prefer .Create & save up to 100 systems .Instant notifications for picks of up to 10 systems . Receive daily e-mail notifications for the current matches that fit your active systems. There is no need to stay all day hooked on the PC, enable your alerts and you won’t miss a pick. Get access to our massive football betting database. Create your betting systems in no time. Explore betting systems made by our community. Receive instant notifications for your picks.